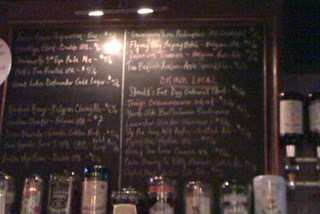 (the Locals Only board at TJs continues to grow) (Bear Republic Racer 5 IPA-cask conditioned)As I mentioned yesterday, in lieu of being in SF Proper, I'm embarking on an East Coast version of San Francisco Beer Week. In some ways, I'll try to mimic some of the events and beer drinking that I would have done on the Left Coast. Today in SF, my plans had me careening around the city from Humphry Slocumbe where Jesse Friedman was collaborating with them on beer, ice cream, and photography to The Front Porch for Drake's Belgian Trippel release to a late night rendezvous at Triple Rock over in Berkeley for some IIMAX. In between, I was going to hop on BART to San Leandro where Drake's is hosting a Tribute to (journalist) Bill Brand. 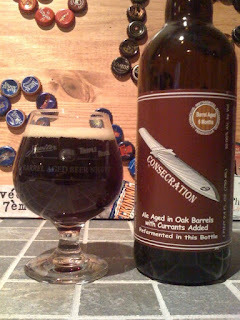 I shared a table and dinner with Bill Brand the night of his fateful accident last year during SF Beer Week and I was really looking forward to some of his favorite beers and the Tribute Beers that were brewed in his honor/memory and the gathering of friends and family that are sure to show up. So I'm thinking that since I was going to be hitting up some of the Bay Area's finest establishments and drinking some of their great beers, that I would head to one of the Philly Area's finest in Paoli...TJs. Have a dinner and drink a mix of beers. 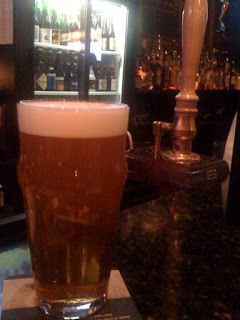 I'm thinking the night will begin with Sierra Nevada Glissade, since I was hoping to meet up with Terence Sullivan and others from Sierra Nevada. 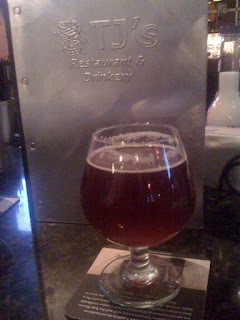 Then, some other beers from California like Lost Abbey's Angel's Share and a great cask-conditioned Bear Republic Racer 5 IPA. Since there was a double IPA festival last weekend at The Bistro in Hayward, the Brooklyn Blast (DIPA) makes sense to also dip into tonight as well as Cantillon's Vigneronne (think: Sour Fest at Triple Rock) and Yards Olde Bartholomew (think: Toronado Barleywine Festival). That should get me through tonight and I'm sure make all you SFers jealous....y'think?